Background: Chronic pain patients frequently suffer from psychological symptoms. There is no consensus concerning the prevalence of severe anxiety and depressive symptoms and the strength of the associations between pain intensity and psychological distress. Although an important aspect of the clinical picture is understanding how the pain condition impacts life, little is known about the relative importance of pain and psychological symptoms for individual’s life impact. The aims of this study were to identify subgroups of pain patients; to analyze if pain, psychological distress, and life impact variables influence subgrouping; and to investigate how patients in the subgroups benefit from treatments. Results: Based on >35,000 patients, 35%–40% had severe anxiety or depressive symptoms. Severe psychological distress was associated with being born outside Europe (21%–24% vs 6%–8% in the category without psychological distress) and low education level (20.7%–20.8% vs 26%–27% in the category without psychological distress). Dose relationships existed between the two psychological distress variables and pain aspects, but the explained variances were generally low. Pain intensity/severity and the two psychological distress variables were significantly associated (R2=0.40–0.48; P>0.001) with the two life impact variables (pain interference and life control). Two subgroups of patients were identified at baseline (subgroup 1: n=15,901–16,119; subgroup 2: n=20,690–20,981) and the subgroup with the worst situation regarding all variables participated less in an MMRP (51% vs 58%, P<0.001) but showed the largest improvements in outcomes. Compared with the general population, individuals with chronic pain more frequently suffer from psychological symptoms/conditions, especially anxiety and low mood.6–9 There are different theories about the complex bidirectional relationship between pain and mood (ie, depressive and anxiety symptoms).10–16 The presence of depressive and anxiety-related symptoms/disorders in people with chronic pain is associated with lower levels of functioning, poorer responses to treatment, and greater health costs.10,17–26 Furthermore, spreading of pain, long pain duration, and high pain severity have been associated with worse course of depressive and anxiety disorders. A related question concerns the strength of the associations between pain aspects such as intensity and severity of psychological distress. Relatively low correlations might indicate that reducing psychological symptoms will not reduce pain and vice versa. However, to some extent, changes in depressive and anxiety symptoms are correlated with changes in pain, but it has been shown that remission of depression and/or anxiety does not eliminate pain.31 MMRP distinguishes itself as a well-coordinated intervention leading to a complex intervention instead of a single treatment and generally includes education, supervised physical activity, training in simulated environments, and cognitive behavioral therapy coordinated by an interdisciplinary team. The presence of disturbing psychological symptoms might indicate a need to consider the complex interaction of these aspects to further optimize present MMRP to include relevant psychological interventions. Investigating the strength of multivariate correlation pattern between pain aspects and symptoms of depression and/or anxiety may also shed light on which of these variables vary the most and contribute the most to variations in the clinical picture and the outcome of rehabilitation efforts with respect to not only symptom reduction but also return to work rate. This knowledge is important for designing clinical assessments of chronic pain patients. An important aspect of the clinical assessment is how the pain condition impacts life of the patient. The interference with daily life is one of the reasons for seeking health care.32 Pain interference – an important disease-specific measure of physical function33 – reflects how pain affects work, leisure, and household activities as well as relationships with friends and family. A sense of control may represent the perceived ability to manage pain or pain-related matters,34 eg, the perceived ability to control daily life and/or pain and the ability to address problems and handle stressful situations.35,36 The ability to control pain seems important for choice of coping strategies.37 Perceived life control has been shown to correlate relatively strongly both with pain and psychological distress in chronic pain patients, but these relationships have not been further explored.37 There is a lack of large studies of real-life patients investigating if, to what extent, and how pain aspects and psychological symptoms determine reported levels of pain interference and life control. In the context of improving outcomes of interventions, there is a great interest in identifying subgroups of chronic pain patients to investigate how these patients benefit from pain rehabilitation.38 Most studies have been hypothesis driven with respect to the input variables used for the subgrouping. Although several studies have used psychological characteristics as input variables to identify the subgroups,39–44 few studies have used objective methods to select input variables from a larger set of variables to identify clusters. To investigate the prevalence of severe depressive and anxiety symptoms and to analyze to what extent such symptoms intercorrelate with common pain characteristics and sociodemographic variables. To explore how pain aspects and psychological distress symptoms intercorrelate with two life impact variables, ie, pain interference and life control. To identify clusters of patients based on the exploration of baseline variables and to investigate which cluster benefits most from MMRP in the longitudinal perspective. The SQRP is recognized by the Swedish Association of Local Authorities and Regions. All relevant clinical departments within specialist care throughout Sweden deliver data to SQRP.37 The SQRP is based on questionnaires (ie, PROM data) that capture patients’ background, pain aspects, and psychological distress symptoms (eg, depression and anxiety) together with activity/participation aspects and health-related quality of life variables. Patients complete the SQRP questionnaires on up to three occasions: 1) during assessment at the first visit to the clinical department (baseline); 2) immediately after MMRPs for those patients who participate in MMRP; and 3) at a 12-month follow-up. In this study, cross-sectional analyses were made from patients who answered the SQRP at baseline. For the longitudinal analyses, the subgroup of patients who participated in MMRP was used (ie, also using the data registered immediately after MMRP and at the 12-month follow-up). All chronic pain patients (>3 months) and patients >18 years of age (no upper age limit) were included in this study. These patients were referred to different specialist clinics associated with SQRP between 2008 and 2016 from ~30 clinical departments throughout Sweden. Sociodemographic variables, pain aspects, psychological distress variables, and life impact variables were selected from the SQRP and used in the analyses. Sociodemographic variables were age (years), gender (man or woman), education level (dichotomized into university vs other alternatives and denoted as University), and country of birth (dichotomized into Europe vs outside Europe and denoted as Outside Europe). Average pain intensity the previous week was captured using an NRS. The endpoints of the NRS had verbal descriptions (ie, 0 =no pain and 10 =worst possible pain). This variable was denoted as NRS-7d. The spatial extent of pain on the body was measured using 36 predefined anatomical areas (18 on the front and 18 on the back of the body). The patients marked the anatomical areas where they experienced pain: 1) head/face, 2) neck, 3) shoulder, 4) upper arm, 5) elbow, 6) forearm, 7) hand, 8) anterior aspect of chest, 9) lateral aspect of chest, 10) belly, 11) sexual organs, 12) upper back, 13) low back, 14) hip/gluteal area, 15) thigh, 16) knee, 17) shank, and 18) foot. The sum of painful areas was calculated (possible range: 0 and 36). This sum was labeled as the PRI. The HADS, which measures symptoms of anxiety and depression, has good psychometric characteristics.45,46 The validated Swedish translation of HADS was used and chosen to reflect aspects of psychological distress.45,47 HADS comprises seven items in each of the depression and anxiety subscales (HAD-Depression and HAD-Anxiety). Both subscale scores range between 0 and 21. A score of 7 or less on each subscale indicates a noncase, a score of 8–10 indicates a possible case, and a score of 11 or more indicates a definite case.45 In this study, >11 was considered as severe anxiety and depressive symptoms. The SQRP does not provide detailed information about the MMRPs at the individual centers. Generally, the programs – in agreement with international suggestions48 – are delivered by a team of professionals (generally physician, psychologist, occupational therapist, physiotherapist, and social worker) and based on a biopsychosocial model of chronic pain. MMRPs are mainly outpatient group-based programs but with opportunities for individual interventions if necessary based on the clinical picture and the aims of the individual patient. Important components of the group-based part are cognitive behavioral treatment, physiotherapy including physical exercise, interventions targeting improved ergonomics, and occupational therapy. In addition, lectures on basic pain physiology and pain management are offered to patients and often to relatives, friends, and colleagues. The programs generally have a duration of several weeks (4–8 weeks) and with group-based activities 20–30 hours/week. In addition, patients can have tasks to do at home including encouraging them to do physical exercise on their own. Recently published terminology for multicomponent treatment approaches identifies MMRP as an example of interdisciplinary treatment (https://www.iasp-pain.org/PublicationsNews/NewsDetail.aspx?ItemNumber=6981). PCA was used to investigate the correlation patterns for the investigated variables. A cross-validation technique was used to identify nontrivial components (p). Variables loading on the same component p are correlated, and variables with high loadings but with opposing signs are negatively correlated. Variables with high absolute loadings – ie, 95% jackknife uncertainty confidence interval nonequal to zero – were considered significant. Note that the loadings obtained from SIMCA-P+ are lower and not comparable with those from, eg, SPSS. SIMCA-P+, in contrast to traditional statistical packages such as SPSS, uses the Non-linear Iterative Partial Least Squares algorithm when compensating for missing data: for variables/scales, maximum 50% missing data and for subjects, maximum 50% missing data. The obtained components are per definition not correlated and are arranged in decreasing order with respect to explained variation. R2 describes the goodness of fit – the fraction of sum of squares of all the variables explained by a principal component p.52 Q2 describes the goodness of prediction – the fraction of the total variation of the variables that can be predicted by a principal component using cross-validation methods.52 Outliers were identified using two methods: 1) score plots in combination with Hotelling’s T2 and 2) distance to model in X-space. No extreme outliers were detected. PCA was used to identify the most important variables, and the most important variables were used as input variables in a two-step cluster analysis to identify clusters (log-likelihood measure distance, number of clusters determined automatically, and Schwartz’s Bayesian cluster criterion as options). To obtain reasonably large clusters, we required that the ratio between clusters sizes be <3.0, per the convention for this analysis. ANCOVA was used to manage regression toward the mean bias for the changes in outcome variables after MMRP using baseline values as covariates53 and with the requirement that no interaction exists between independent variable (cluster membership) and the covariate. OPLS was used for the multivariate regression analyses of pain interference and life control.52 The VIP indicates the relevance of each X-variable pooled over all dimensions and Y-variables, the group of variables that best explains Y. VIP ≥1.0 was considered significant if VIP had 95% jackknife uncertainty confidence interval nonequal to zero. p(corr) was used to note the direction of the relationship (positive or negative). This is the loading of each variable scaled as a correlation coefficient and thus standardizing the range from –1 to +1.51 p(corr) is comparable between models. An absolute p(corr) ≥0.5 is considered significant.51 For each regression, R2, Q2, and the result (ie, P-value) of a cross-validated analysis of variance (CV-ANOVA) are reported. Abbreviations: HAD-Anxiety, Anxiety subscale of Hospital Anxiety and Depression Scale; HAD-Depression, Depression subscale of Hospital Anxiety and Depression Scale; life control, MPI subscale concerning perceived life control; MPI, Multidimensional Pain Inventory; NRS-7d, average pain intensity the last week according to a numeric rating scale; Pain interference, MPI subscale concerning pain-related interference in everyday life; Pain severity, MPI subscale concerning pain severity; PRI, Pain Region Index. The prevalence of severe anxiety symptoms (>11) according to HAD-Anxiety was 39.5%. The corresponding figure for HAD-Depression was 35.2%, and 24.8% had high values (>11) on both HAD-Anxiety and HAD-Depression. The proportion of patients with less severe psychological distress according to these two variables (ie, <11) was 50.3%. The continuous variables stratified for HAD-Anxiety and HAD-Depression are shown in Tables 2 and 3. The three categories of the two subscales of HADS were generally associated with significant differences in the investigated variables. Hence, the category with most severe depressive and anxiety symptoms had the worst situation with respect to pain and life impact. Relatively more men than women had severe depressive symptoms (>11 for HAD-Depression) (men: 37.9% vs women: 34.1%; χ2=54.6, P<0.001), but no gender differences were found for severe anxiety symptoms (HAD-Anxiety) (men: 39.3% vs women: 39.5%; χ2=0.104, P=0.950). Note: Furthest to the right is the result of ANOVA (P-value) and post hoc tests. Abbreviations: HAD-Anxiety, Anxiety subscale of Hospital Anxiety and Depression Scale; HAD-Depression, Depression subscale of Hospital Anxiety and Depression Scale; Life control, MPI subscale concerning perceived life control; MPI, Multidimensional Pain Inventory; NE, not equal; NRS-7d, average pain intensity the last week according to a numeric rating scale; Pain interference, MPI subscale concerning pain-related interference in everyday life; Pain severity, MPI subscale concerning pain severity; PRI, Pain Region Index. The proportion of patients born outside Europe differed significantly between the HAD-Anxiety categories (0–7: 5.5%, 8–10: 10.3%, and 11–21: 24.1%; χ2=2,311.2, df=2, P<0.001) and the HAD-Depression categories (0–7: 7.8%, 8–10: 13.9%, and 11–21: 21.0%; χ2=1,086.9, df=2, P<0.001). Hence, patients born outside Europe were disproportionally represented in the more severe categories of anxiety and depressive symptoms. The proportion with university education also differed across the three HAD-Anxiety categories (0–7: 27.0%, 8–10: 24.4%, and 11–21: 20.8%; χ2=160.2, df=2, P<0.001) and the HAD-Depression categories (0–7: 26.4%, 8–10: 24.6%, and 11–21: 20.7%; χ2=133.6, df=2, P<0.001). Hence, the categories with severe psychological distress had the lowest proportion with university education. Highly significant bivariate intercorrelations according to Pearson’s test exist between the pain variables and the psychological distress variables (Table 4). As expected, the bivariate correlations showed high intercorrelations between the two psychological distress variables (r=0.67) and between NRS-7d and pain severity (r=0.75) (Table 4). However, the explained variances between pain intensity/severity variables (NRS-7d and pain severity) and the psychological variables (HAD-Anxiety and HAD-Depression) were low since r2 varied between 3% and 11%. The corresponding figures for the explained variations between pain variables and psychological distress variables vs pain interference were 5%–35% and 4%–32% for life control. Age did not correlate significantly with several of the other variables or had very low r2. The multivariate correlation pattern between the variables was investigated using PCA. Variables located near each other (eg, HAD-Depression vs HAD-Anxiety) are more strongly correlated than more distant variables (eg, HAD-Depression vs Pain severity) even though they may show relatively high loadings on p1. The obtained significant model consisted of one significant component (R2=0.32, Q2=0.19, n=38,934). Figure 1 shows the loading plot, ie, the relationship between the investigated variables. Figure 1 Loading plot from the PCA of background variables, pain variables, psychological distress variables, and two life impact variables. To facilitate the graphic interpretation, a second nonsignificant component was calculated (ie, variations along the Y-axis are not significant). Hence, two components (p1 [horizontal] and p2 [vertical]) are shown. Abbreviations: HAD-Anxiety, Anxiety subscale of Hospital Anxiety and Depression Scale; HAD-Depression, Depression subscale of Hospital Anxiety and Depression Scale; life control, MPI subscale concerning perceived life control; MPI, Multidimensional Pain Inventory; MPI-Pain interference, MPI subscale concerning pain-related interference in everyday life; NRS-7d, average pain intensity the last week according to a numeric rating scale; Outside Europe, born outside Europe; pain severity, MPI subscale concerning pain severity; PCA, principal component analysis; PRI, Pain Region Index; University, University education. The variables with the strongest absolute loadings on the first component (p1) showed the largest variation across subjects and were significantly correlated in the multivariate context. Pain severity, pain interference, HAD-Depression, life control, HAD-Anxiety, and NRS-7d had the highest absolute loadings and were thus intercorrelated (Figure 1). Life control had a negative correlation in relation to the other important variables. Because age, gender, and university education had low importance (ie, they were located near zero according to p1), they were not significantly correlated with the other variables in the multivariate context. Pain interference and life control were regressed using the sociodemographic variables, pain variables, and psychological distress variables as regressors. For both regressions, highly significant models were obtained (Table 5). Notes: VIP (VIP >1.0 is significant) and p(corr) are reported for each regressor, ie, the loading of each variable scaled as a correlation coefficient and thus standardizing the range from –1 to +1. The sign of p(corr) indicates the direction of the correlation with the dependent variable (+, positive correlation; –, negative correlation). The four bottom rows of each regression report R2, Q2, P-value of the CV-ANOVA, and number of patients included in the regression (n). Variables in bold type are significant regressors (VIP >1.0). Abbreviations: CV-ANOVA, cross-validated analysis of variance; HAD-Anxiety, Anxiety subscale of Hospital Anxiety and Depression Scale; HAD-Depression, Depression subscale of Hospital Anxiety and Depression Scale; Life control, MPI subscale concerning perceived life control; MPI, Multidimensional Pain Inventory; NRS-7d, average pain intensity the last week according to a numeric rating scale; Pain interference, MPI subscale concerning pain-related interference in everyday life; Pain severity, MPI subscale concerning pain severity; PRI, Pain Region Index; Outside Europe, born outside Europe; University, University education; OPLS, orthogonal partial least square regressions; VIP, Variable Importance in Projection. A mix of pain and psychological distress variables (ie, pain severity, NRS-7d, HAD-Depression, and HAD-Anxiety) was significantly associated with pain interference (one predictive component) (Table 5, left part). Pain severity was the variable with the strongest association with pain interference. PRI (ie, spreading of pain) and sociodemographic variables had no significant importance in this multivariate context. Hence, pain interference was determined both by pain and psychological variables. Positive correlations existed between these significant variables and pain interference. 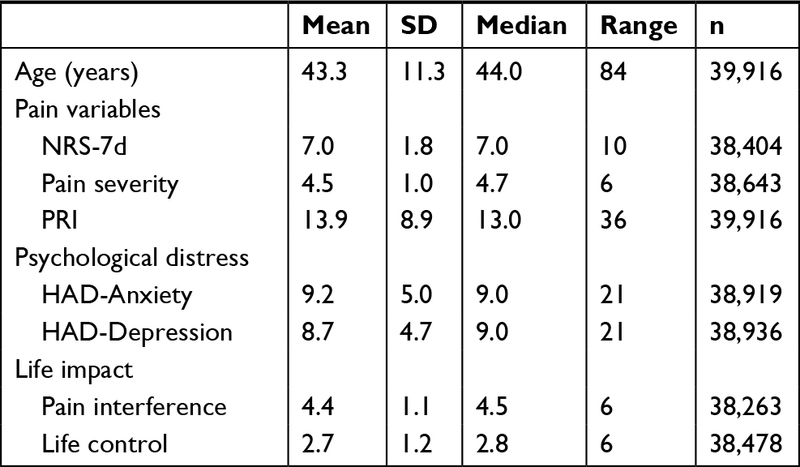 The two psychological distress variables HAD-Depression and HAD-Anxiety followed by pain severity and NRS-7d showed the strongest and significant associations with life control (Table 5, right part). The significant OPLS regression of life control consisted of one predictive component. Spreading of pain (PRI) and sociodemographic variables had no significant importance. Hence, life control was strongly correlated with two psychological variables even though pain intensity variables also contributed significantly (Supplementary S1). As expected, negative correlations existed between these significant variables and life control. The regressions displayed in Table 5 were recalculated with the two psychological distress variables dichotomized (severe symptoms vs less severe symptoms; cutoff >11) and very similar results were obtained (Supplementary S2). NRS-7d, pain severity, HAD-Anxiety, HAD-Depression, pain interference, and life control were the most important variables at baseline and showed the greatest variability across patients according to the first component p1 of the PCA (Figure 1). These variables were then used as input variables in a two-step cluster analysis, which identified two clusters. 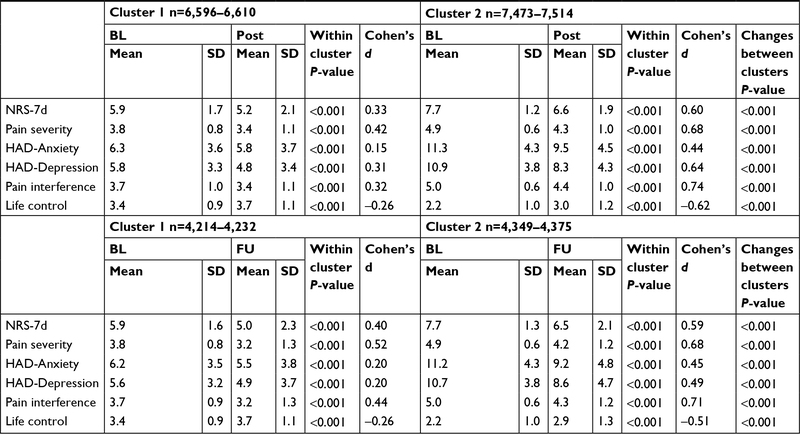 As intended, all input variables differed significantly between the two clusters (Table 6); very large effect sizes were noted. Cluster 2, which was somewhat larger than cluster 1, reflected a significantly worse situation according to all input variables. In addition, according to HADS (cutoff >11), 59.4% of patients in cluster 2 and 12.8% of patients in cluster 1 had severe symptoms of anxiety (χ2=8,287.9, df=1, P<0.001); corresponding figures for HAD-Depression (with the cutoff ≥11) were 56.1% and 9.6% (χ2=9,409.9, df=1, P<0.001). Notes: Continuous variables are shown as mean and SD, while the category variables are shown as proportions (%). The two clusters were also compared with respect to PRI and sociodemographic variables. Furthest to the right is given effect sizes (Cohen’s d). Abbreviations: HAD-Anxiety, Anxiety subscale of Hospital Anxiety and Depression Scale; HAD-Depression, Depression subscale of Hospital Anxiety and Depression Scale; Life control, MPI subscale concerning perceived life control; MPI, Multidimensional Pain Inventory; NA, not applicable; NRS-7d, average pain intensity the last week according to a numeric rating scale; Pain interference, MPI subscale concerning pain-related interference in everyday life; Pain severity, MPI subscale concerning pain severity; PRI, Pain Region Index; Outside Europe, born outside Europe; University, University education. The two clusters were then compared for the variables not included as input variables in the cluster analysis. Spreading of pain on the body (PRI) was more pronounced in cluster 2 (Table 6), which had a somewhat significantly higher proportion of women. A nearly three times higher prevalence of patients born outside Europe and a lower proportion with university education were also evident in cluster 2 (Table 6). More cluster 1 patients participated in MMRP than cluster 2 patients (57.5% vs 51.0%, χ2=144.5, df=2, P<0.001). Significant differences existed for all variables post-MMRP (all P<0.001) when comparing the two clusters; a similar pattern was also found at the 12-month follow-up (all P<0.001) (Table 7). Marked and significant differences also existed for the dichotomized psychological distress (cutoff >11) between the two clusters at post-MMRP (severe anxiety symptoms: cluster 1 =11.2% and cluster 2 =39.8%, χ2=1,960.1, df=2, P<0.001; severe depressive symptoms: cluster 1 =6.2% and cluster 2 =29.7%, χ2=1,959.5, df=2, P<0.001) and at the 12-month follow-up (severe anxiety symptoms: cluster 1 =10.5% and cluster 2 =37.8%, χ2=1,156.5, df=2, P<0.001; severe depressive symptoms: cluster 1 =8.1% and cluster 2 =32.9%; χ2=1,114.8, df=2, P<0.001). Notes: Both within-cluster changes (P-value) and between-cluster changes (P-value) are shown. For the within comparisons are also reported Cohen’s d. Life control, MPI subscale concerning perceived life control; pain interference, MPI subscale concerning pain-related interference in everyday life; pain severity, MPI subscale concerning pain severity. Abbreviations: HAD-Anxiety, Anxiety subscale of Hospital Anxiety and Depression Scale; HAD-Depression, Depression subscale of Hospital Anxiety and Depression Scale; MPI, Multidimensional Pain Inventory; NRS-7d, average pain intensity the last week according to a numeric rating scale; PRI, Pain Region Index; MMRP, multimodal/multidisciplinary rehabilitation program; BL, baseline; FU, follow-up. In both clusters, significant improvements were found in the six investigated variables both between baseline and post-MMRP and between baseline and the 12-month follow-up (Table 7). When comparing the absolute changes between the two clusters post-MMRP and at the 12-month follow-up, cluster 2 consistently showed the greatest improvements (all P<0.001) (Table 7). To handle possible regression toward the mean biases, we also checked these changes with ANCOVA using the baseline value as a covariate; the cluster differences remained clearly significant (P<0.001) for the changes related to both time points for NRS-7d, pain severity, pain interference, and life control. The assumption of no interaction between independent variable and covariate was violated for HAD-Anxiety and HAD-Depression. The effect sizes for the within clusters showed consistently higher absolute and generally moderate effect sizes in cluster 2 (except for HAD-Anxiety for both comparisons and HAD-Depression for one comparison), whereas there were generally small effect sizes in cluster 1 (except for pain severity: baseline vs the 12-month follow-up). Thirty-five percent to 40% of patients had severe anxiety or depressive symptoms with an overrepresentation in patients born outside Europe, low education level, and male gender (only depressive symptoms). Dose relationships existed between the two psychological distress variables and pain aspects (intensity, severity, and spreading) and life impact variables. Pain intensity/severity and psychological distress variables were significantly associated with the two life impact variables at baseline. Two clusters of patients were identified at baseline. A lower percentage of patients in the cluster with worse clinical situation participated in MMRP but showed larger positive changes in outcomes. This cluster also had an overrepresentation of patients born outside Europe and patients with lower education level. A recent meta-analysis concluded that chronic pain was more strongly associated with anxiety than depression,55 a finding that agrees with our finding of a somewhat higher prevalence of severe anxiety symptoms than severe depressive symptoms (39.5% vs 35.2%). In contrast to the meta-analysis, we found that depressive symptoms were more strongly correlated with pain intensity/severity and life impacts than anxiety symptoms (Tables 4 and 5). A substantial part of the present chronic pain patients referred to specialist clinics perceived considerable psychological distress and one-fourth of the patients report severe psychological distress according to both facets of HADS. Our nationwide results agree with an SQRP study of chronic pain patients (n=4,665) referred to a university hospital where 40% reported severe anxiety and/or depressive symptoms according to HADS.37 In chronic low back pain patients who were on sick leave, 18% were possible cases of depression (cutoff >8) and 21% were possible cases of anxiety (cutoff >8) according to HADS.30 Lower figures may have been due to selection mechanisms since these patients were recruited to take part in a randomized controlled study, whereas patients in this study represented a clinical population at the specialist level. As mentioned in the introduction, prevalence estimates of anxiety and depressive comorbidities/symptoms in chronic pain cohorts vary considerably,15,28,29,45 a situation that partly reflects methodological issues. It has been stated that the highest prevalence of depression is found among patients attending specialist pain departments.10,56 No systematic clinical assessment of anxiety and/or depressive conditions is available in SQRP, but at the higher end of the recommended cutoffs (ie, >11) the specificity for identifying cases of depression or anxiety disorders are good for both HAD-Depression and HAD-Anxiety.46 Although most of the patients did not report severe levels of psychological distress using the cutoff >11 for either or both scales, these patients may still suffer from psychological distress to some extent, which contribute to negative life impacts (Table 5). A dose relationship existed between pain aspects (intensity, severity, and spreading) and anxiety and depressive symptoms and vice versa (Tables 2–3). In addition, the two life impact variables showed dose relationships vs the two psychological distress variables. However, the bivariate correlation coefficients were low between, eg, pain intensity/severity and the two psychological distress variables (r=0.26–0.33) (Table 4). Similar results have been reported elsewhere.37,57 The multivariate correlation analysis (PCA; Figure 1) confirmed the bivariate correlation pattern found in Table 4. One clinical consequence of the low correlations is that high pain intensity reported by a patient at the clinical assessment will not necessarily mean severe psychological distress even though this is the case at the group level. The different categories of HAD-Anxiety and HAD-Depression showed disproportional distributions of the sociodemographic variables. Low education level and being born outside Europe were somewhat, although significantly, overrepresented in the patient group reporting the most severe depressive and anxiety symptoms. Moreover, male gender was overrepresented in the most severe group of depressive symptoms. In a Danish register linkage study of patients attending a pain specialist clinic, men had higher prevalence of depression and anxiety disorders.58 In the SQRP, women were obviously overrepresented at the specialist level, a finding also reported in the Danish study.58 The higher proportion of women could be due to factors such as women, compared with men, had a higher prevalence of chronic pain,59,60 different severity (eg, with respect to spreading of pain), and different societal selection mechanisms for treatment and rehabilitation. The literature provides many explanations for the complex bidirectional associations between chronic pain and anxiety and depressive symptoms. Taken together, these explanations point toward shared (transdiagnostic) mechanisms. On a biological level, there is evidence of similar activated and modulated brain regions including neuroplasticity alterations,61–63 reduced levels of norepinephrine and serotonin,64 neuroinflammation, hyperactivity of hypothalamic–pituitary–adrenal axis, and autonomic dysregulation,31,65 dysregulation in the endocannabinoid system,66,67 sleeping disturbances, and genetics.16,68,69 On a psychological and social level, there is accumulating evidence for mutually shared vulnerability and maintaining factors (including similar consequences, ie, social isolation and reduced physical activity).16,70 Emotion regulation may be seen as a transdiagnostic process tying pain and depression/emotion.71,72 In this view, catastrophizing, behavioral avoidance, and thought suppression are seen as adaptive psychological efforts to regain emotional homeostasis in the face of aversive experiences such as pain and low mood or anxiety. Depression and severe anxiety as well as chronic pain may be a consequence of failed efforts to regulate these negative experiences. Spreading of pain has been associated with worse outcomes for pain intensity, chosen coping strategies and health aspects in patient cohorts81 and in population studies.82–84 In our nationwide study, PRI was not a significant regressor of life impacts. Different results could have been due to the fact that our patients represent the most severe cases and a ceiling effect may be present for PRI. In addition, variables that were not used for identification showed significant cluster differences (Table 6). These results, together with the results obtained at stratification of the HADS variables, pinpoint that a generally severe situation has certain sociodemographic characteristics, which reasonably must be considered when planning interventions and treatments. Both clusters showed an agreement with earlier smaller studies from SQRP, ie, there were significant improvements in the input variables. The Swedish MMRPs are based on the available evidence that this type of intervention is more effective than usual care;87–93 the effect sizes are generally small to moderate. Smaller uncontrolled studies have reported significant effects after MMRP on several of the variables investigated here.94–97 This study was not primarily performed to evaluate the effectiveness of MMRP, which requires randomized controlled trials and systematic reviews/meta-analysis. Instead, this study investigates chronic pain patients in real-world practice settings within the concept of practice-based evidence,98 and the longitudinal results (Table 7) agree with the systematic reviews of MMRP. If no effects of MMRP were observed, MMRP in real-world practice settings do not give the anticipated results. Severe psychological distress has been associated with worse treatment outcomes;18,25,26,99 however, cluster 2, which had the highest pain intensity and the most severe anxiety and depression symptoms, had significantly larger improvements for all variables (Table 7) also when controlling for possible regression toward the mean. Even if greater improvement in cluster 2 is interpreted as a sign of regression to the mean and that these patients did not benefit from MMRP more than cluster 1, this cluster still improves at least as well from MMRP as those without severe psychological distress symptoms (cluster 1). This may seem unexpected, but it is important to recognize that MMRPs contain emotional and behavioral interventions stemming from cognitive behavioral treatment clearly addressing psychological symptoms. The optimal composition, ie, included components and their intensity, and duration of a complex intervention such as MMRPs with respect to the clinical presentations of patients are not well understood.87,91,100,101 Based on the differences between clusters 1 and 2 both at baseline and after MMRP, it is unclear whether MMRPs really should have the same content for the two clusters. For cluster 2, it appears that emotional and behavioral interventions are necessary as generally applied in MMRPs in Sweden and this finding agrees with the literature.102 Still, it could be questioned whether these interventions or other components of MMRPs were optimal (contents, intensity, and duration) since, eg, the psychological distress levels after MMRP were still high in cluster 2. However, the application of such methods may need to be tailored to better target symptoms and characteristics specific to patients belonging to cluster 1 with low/normal levels of psychological distress if outcomes for this group are going to improve. The evaluation of complex interventions such as MMRP is not clear-cut, and different definitions of a positive outcome of an MMRP trial have been briefly presented elsewhere.49 In clinical practice, there are several outcomes and to make things even more complicated the important goals of MMRP for the individual patient differs. Whether pain intensity/severity belongs to the important outcomes of pain treatments is a matter of debate among researchers, clinicians, and patients.103–106 The concept of one or few primary outcomes and few secondary outcomes applied in pharmacological studies does not reflect the complexity of MMRP. In cluster 2, the effect sizes were moderate for most variables, while cluster 1 generally showed insignificant or small effect sizes (Table 7). In addition, anchor-based methods for determining if the changes are clinically important will give similar results. Hence, for the MPI variables and especially the pain interference scale, a change of 0.6 has been considered important107,108 and for NRS-7d a reduction of at least two units or 30% has been considered important.109 Neither of the two clusters exhibited important changes in NRS-7d immediately after MMRP and the 12-month follow-up (Table 7), but pain severity showed important changes. All MPI variables showed at least 0.6 changes in cluster 2 at both time-points compared with baseline values (Table 7). Cluster 1 only fulfilled this criterion for pain severity at the 12-month follow-up. Unlike comparisons using such a criterion (Cohen’s d or anchor-based), it can be argued that smaller simultaneous changes for several outcomes may still be clinically important. In this sample, representative of the population of chronic pain patients seeking specialist care in Sweden, 14% were immigrants born outside Europe. This prevalence is a slight significant overrepresentation (χ2=263.01, df=1, P<0.001) compared with the proportion (11.5%) of immigrants born outside Europe in the general population in Sweden (Statistics Sweden, 2018; https://www.scb.se/en/). Moreover, these patients are disproportionally represented in cluster 2; nearly three times higher prevalence of immigrant patients compared with the other cluster. This means that chronic disabling pain (operationalized as seeking specialist care and high distress and interference reporting) is more prevalent among immigrants. This points toward the importance of not overly biologizing pain but instead viewing and understanding pain in a biopsychosocial context (the link with education level also fits in this picture). Moreover, it also points toward a pressing need to adapt health care and MMRP services to fit the needs of these patients. The data also suggest that this is not quite the case at this moment as these patients are proportionally underrepresented in MMRP participation. The large number of patients with chronic pain conditions with a nationwide representation is an obvious strength of this study. It is likely that the findings are representative and close to the true population values for chronic pain patients referred to specialist care. However, patients referred to specialist clinics represent a selection of the most difficult cases, so our results cannot be generalized to patients in primary health care or to persons with chronic pain in the community. We controlled for regression to the mean within the cohort of patients, but the cohort is reasonably an extreme group in relation to, eg, patients within primary health care, and it was not possible to control for such regression to the mean. Strength was the use of advanced multivariate data analysis. Classical statistical methods such as multiple linear regression and logistic regression can quantify the level of relations of individual factors but disregard interrelationships among different factors and thereby ignore system-wide aspects (eg, when a group of variables correlates with the investigated dependent outcome).110 Classical methods assume variable independence when interpreting results,111 and there are several risks considering one variable at a time.112 In the context of our aims, the problems handling missing data, and the obvious risks for multicollinearity problems, we have refrained from using multiple linear regression and logistic regression. Instead, we used statistical methods taking advantage of correlated regressors. On the contrary, it is not possible, as in multiple linear or logistic regression, to isolate the effects for a certain variable upon the dependent life impact variables regressed. Another limitation might be that self-reports can be influenced by perceptions of social desirability.77 Changes in the social context may have changed and influenced the longitudinal analyses. However, we used validated and well-known instruments even though they to some extent represented different research epochs. The fact that no control group or treatment as usual group was available, which ethically is complicated to arrange for a registry of real-world practice patients, might have influenced our interpretation of changes after MMRP. Based on >35,000 patients in Sweden referred to specialist care, our study found that 35%–40% of these patients had severe anxiety or depressive symptoms. Severe psychological distress was associated with some sociodemographic aspects. Dose relationships existed between the two psychological distress variables and pain aspects, but these correlations were relatively weak. Pain intensity/severity and the two psychological distress variables were significant regressors of the two life impact variables. Two clusters of patients were identified at baseline, and the patients in the cluster with the worse situation participated less in MMRP but showed the largest improvements in outcomes. The principle pattern of absolute differences between the two clusters remained after MMRP. The results emphasize the need to assess both pain and psychological distress and not take for granted that pain involves high psychological stress in the individual case. Moreover, this study showed that not all patients benefit from MMRP. A better matching between common clinical pictures and the content of MMRPs may help improve results. We only partly found support for treatment resistance in chronic pain patients with psychological distress burden. ANCOVA, analysis of covariance; HADS, Hospital Anxiety and Depression Scale; HAD-Anxiety, Anxiety subscale of Hospital Anxiety and Depression Scale; HAD-Depression, Depression subscale of Hospital Anxiety and Depression Scale; life control, MPI subscale concerning perceived life control; MMRP, multimodal/multidisciplinary rehabilitation program; MPI, Multidimensional Pain Inventory; NRS, numeric rating scale; NRS-7d, average pain intensity the last week according to a numeric rating scale; OPLS, orthogonal partial least square regressions; Outside Europe, born outside Europe; pain interference, MPI subscale concerning pain-related interference in everyday life; pain severity, MPI subscale concerning pain severity; PCA, principal component analysis; p(corr), X loading p scaled as a correlation coefficient between X and t, ie, this is the loading of each variable scaled as a correlation coefficient and thus standardizing the range from –1 to +1; PRI, Pain Region Index; PROM, Patient Reported Outcome Measures; SQRP, The Swedish Quality Registry for Pain Rehabilitation; University, University education; VIP, Variable Importance in Projection. The study was conducted in accordance with the Helsinki Declaration and Good Clinical Practice and approved by the Ethical Review Board in Linköping (Dnr: 2015/108-31). All participants received written information about the study and gave their written consent. The datasets generated and/or analyzed in this study are not publicly available as the Ethical Review Board has not approved the public availability of these data. This study was supported by grants from the Swedish Research Council, County Council of Östergötland (Research-ALF), and AFA Insurance. AFA Insurance, a commercial founder, is owned by Sweden’s labor market parties: The Confederation of Swedish Enterprise, the Swedish Trade Union Confederation (LO), and The Council for Negotiation and Co-operation (PTK). AFA Insurance insures employees in the private sector, municipalities, and county councils. AFA Insurance does not seek to generate a profit, which implies that no dividends are paid to shareholders. The sponsors of the study had no role in study design, data collection, data analysis, data interpretation, writing of the report, or the decision to submit for publication. The authors had full access to all the data in the study and had final responsibility for the decision to submit for publication. BG extracted the data from SQRP and analyzed the data and drafted the manuscript. All authors contributed to the conception of the study, data analysis, drafting and revising the article, gave final approval of the version to be published, and agree to be accountable for all aspects of the work. Cimmino MA, Ferrone C, Cutolo M. Epidemiology of chronic musculoskeletal pain. Best Pract Res Clin Rheumatol. 2011;25(2):173–183. Bergman S, Herrstrom P, Hogstrom K, Petersson IF, Svensson B, Jacobsson LT. Chronic musculoskeletal pain, prevalence rates, and sociodemographic associations in a Swedish population study. J Rheumatol. 2001;28(6):1369–1377. Wijnhoven HA, de Vet HC, Picavet HS. Prevalence of musculoskeletal disorders is systematically higher in women than in men. Clin J Pain. 2006;22(8):717–724. Steingrímsdóttir ÓA, Landmark T, Macfarlane GJ, Nielsen CS. Defining chronic pain in epidemiological studies: a systematic review and meta-analysis. Pain. 2017;158(11):2092–2107. Pope CJ, Sharma V, Sharma S, Mazmanian D. A systematic review of the association between psychiatric disturbances and endometriosis. J Obstet Gynaecol Can. 2015;37(11):1006–1015. Vincent A, Whipple MO, McAllister SJ, Aleman KM, St Sauver JL. A cross-sectional assessment of the prevalence of multiple chronic conditions and medication use in a sample of community-dwelling adults with fibromyalgia in Olmsted County, Minnesota. BMJ Open. 2015;5(3):e006681–e006681. Gerrits MM, Vogelzangs N, van Oppen P, van Marwijk HW, van der Horst H, Penninx BW. Impact of pain on the course of depressive and anxiety disorders. Pain. 2012;153(2):429–436. Bair MJ, Robinson RL, Katon W, Kroenke K. Depression and pain comorbidity: a literature review. Arch Intern Med. 2003;163(20):2433–2445. Fishbain DA, Cutler R, Rosomoff HL, Rosomoff RS. Chronic pain-associated depression: antecedent or consequence of chronic pain? A review. Clin J Pain. 1997;13(2):116–137. May A. Chronic pain may change the structure of the brain. Pain. 2008;137(1):7–15. Romano JM, Turner JA. Chronic pain and depression: does the evidence support a relationship? Psychol Bull. 1985;97(1):18–34. Hooten WM. Chronic pain and mental health disorders: shared neural mechanisms, epidemiology, and treatment. Mayo Clin Proc. 2016;91(7):955–970. Stubbs B, Koyanagi A, Thompson T, et al. The epidemiology of back pain and its relationship with depression, psychosis, anxiety, sleep disturbances, and stress sensitivity: data from 43 low- and middle-income countries. Gen Hosp Psychiatr. 2016;43:63–70. Ruiz-Párraga GT, López-Martínez AE. The contribution of posttraumatic stress symptoms to chronic pain adjustment. Health Psychol. 2014;33(9):958–967. Linton SJ, Nicholas MK, MacDonald S, et al. The role of depression and catastrophizing in musculoskeletal pain. Eur J Pain. 2011;15(4):416–422. Reme SE, Shaw WS, Steenstra IA, Woiszwillo MJ, Pransky G, Linton SJ. Distressed, immobilized, or lacking employer support? A sub-classification of acute work-related low back pain. J Occup Rehabil. 2012;22(4):541–552. Salazar A, Dueñas M, Mico JA, et al. Undiagnosed mood disorders and sleep disturbances in primary care patients with chronic musculoskeletal pain. Pain Med. 2013;14(9):1416–1425. Outcalt SD, Kroenke K, Krebs EE, et al. Chronic pain and comorbid mental health conditions: independent associations of posttraumatic stress disorder and depression with pain, disability, and quality of life. J Behav Med. 2015;38(3):535–543. Rayner L, Hotopf M, Petkova H, Matcham F, Simpson A, McCracken LM. Depression in patients with chronic pain attending a specialised pain treatment centre: prevalence and impact on health care costs. Pain. 2016;157(7):1472–1479. Sullivan MJ, Adams H, Tripp D, Stanish WD. Stage of chronicity and treatment response in patients with musculoskeletal injuries and concurrent symptoms of depression. Pain. 2008;135(1–2):151–159. Tunks ER, Crook J, Weir R. Epidemiology of chronic pain with psychological comorbidity: prevalence, risk, course, and prognosis. Can J Psychiatry. 2008;53(4):224–234. Trompetter HR, Bohlmeijer ET, Lamers SMA, Schreurs KMG. Positive psychological wellbeing is required for online self-help acceptance and commitment therapy for chronic pain to be effective. Front Psychol. 2016;7(e152):1–9. Turner JA, Holtzman S, Mancl L. Mediators, moderators, and predictors of therapeutic change in cognitive-behavioral therapy for chronic pain. Pain. 2007;127(3):276–286. Am V, Mohit S. Epidemiology of pain and relation to psychiatric disorders. Prog Neuropsychopharmacol Biol Psychiatry. 2018;87(pt B):159–167. Reme SE, Tangen T, Moe T, Eriksen HR. Prevalence of psychiatric disorders in sick listed chronic low back pain patients. Eur J Pain. 2011;15(10):1075–1080. Gerrits MM, van Marwijk HW, van Oppen P, van der Horst H, Penninx BW. Longitudinal association between pain, and depression and anxiety over four years. J Psychosom Res. 2015;78(1):64–70. Mallen CD, Peat G, Thomas E, Dunn KM, Croft PR. Prognostic factors for musculoskeletal pain in primary care: a systematic review. Br J Gen Pract. 2007;57(541):655–661. Dworkin RH, Turk DC, Farrar JT, et al. Core outcome measures for chronic pain clinical trials: IMMPACT recommendations. Pain. 2005;113(1–2):9–19. Turk DC, Fillingim RB, Ohrbach R, Patel KV. Assessment of psychosocial and functional impact of chronic pain. J Pain. 2016;17(9 Suppl): T21–T49. Bergström G, Jensen IB, Bodin L, Linton SJ, Nygren AL, Carlsson SG. Reliability and factor structure of the Multidimensional Pain Inventory--Swedish Language Version (MPI-S). Pain. 1998;75(1):101–110. Kerns RD, Turk DC, Rudy TE. The West Haven-Yale multidimensional pain inventory (WHYMPI). Pain. 1985;23(4):345–356. Bromley Milton M, Börsbo B, Rovner G, Lundgren-Nilsson A, Stibrant-Sunnerhagen K, Gerdle B. Is pain intensity really that important to assess in chronic pain patients? A study based on the Swedish Quality Registry for Pain Rehabilitation (SQRP). PLoS One. 2013;8(6):e65483. Kamper SJ, Maher CG, Hancock MJ, Koes BW, Croft PR, Hay E. Treatment-based subgroups of low back pain: a guide to appraisal of research studies and a summary of current evidence. Best Pract Res Clin Rheumatol. 2010;24(2):181–191. Svanberg M, Stålnacke BM, Enthoven P, Brodda-Jansen G, Gerdle B, Boersma K. Impact of emotional distress and pain-related fear on patients with chronic pain: subgroup analysis of patients referred to multimodal rehabilitation. J Rehabil Med. 2017;49(4):354–361. Wurm M, Edlund S, Tillfors M, Boersma K. Characteristics and consequences of the co-occurrence between social anxiety and pain-related fear in chronic pain patients receiving multimodal pain rehabilitation treatment. Scand J Pain. 2016;12(1):45–52. Westman AE, Boersma K, Leppert J, Linton SJ. Fear-avoidance beliefs, catastrophizing, and distress: a longitudinal subgroup analysis on patients with musculoskeletal pain. Clin J Pain. 2011;27(7):567–577. Huijnen IP, Rusu AC, Scholich S, Meloto CB, Diatchenko L. Subgrouping of low back pain patients for targeting treatments: evidence from genetic, psychological, and activity-related behavioral approaches. Clin J Pain. 2015;31(2):123–132. Flink IK, Boersma K, Linton SJ. Changes in catastrophizing and depressed mood during and after early cognitive behaviorally oriented interventions for pain. Cogn Behav Ther. 2014;43(4):332–341. de Rooij A, van der Leeden M, Roorda LD, Steultjens MP, Dekker J. Predictors of outcome of multidisciplinary treatment in chronic widespread pain: an observational study. BMC Musculoskelet Disord. 2013;14(1):133. Lisspers J, Nygren A, Söderman E. Hospital anxiety and depression scale (HAD): some psychometric data for a Swedish sample. Acta Psychiatr Scand. 1997;96(4):281–286. Gatchel RJ, McGeary DD, McGeary CA, Lippe B. Interdisciplinary chronic pain management: past, present, and future. Am Psychol. 2014;69(2):119–130. Gerdle B, Molander P, Stenberg G, Stålnacke B-M, Enthoven P. Weak outcome predictors of multimodal rehabilitation at one-year follow-up in patients with chronic pain – a practice based evidence study from two SQRP centres. BMC Musculoskeletal Disorders. 2016; 17(1):490. Bäckryd E, Persson EB, Larsson AI, Fischer MR, Gerdle B. Chronic pain patients can be classified into four groups: clustering-based discriminant analysis of psychometric data from 4665 patients referred to a multidisciplinary pain centre (a SQRP study). PLoS One. 2018;13(2):e0192623. Wheelock ÅM, Wheelock CE. Trials and tribulations of ‘omics data analysis: assessing quality of SIMCA-based multivariate models using examples from pulmonary medicine. Mol Biosyst. 2013;9(11):2589–2596. Eriksson L, Johansson E, Kettaneh-Wold N, Trygg J, Wikström C, Wold S. Multi- and Megavariate Data Analysis; Part I and II. 2nd ed. Umeå: Umetrics AB; 2006. Barnett AG, van der Pols JC, Dobson AJ. Regression to the mean: what it is and how to deal with it. Int J Epidemiol. 2005;34(1):215–220. Molander P, Dong H-J, Äng B, Enthoven P, Gerdle B. The role of pain in chronic pain patients’ perception of health-related quality of life: a cross-sectional SQRP study of 40,000 patients. Scand J Pain. 2018;18(3):417–429. Burke AL, Mathias JL, Denson LA. Psychological functioning of people living with chronic pain: a meta-analytic review. Br J Clin Psychol. 2015;54(3):345–360. Fernandez E, Kerns R. Pain and affective disorders: looking beyond the “chicken and egg” conundrum. In: Giamberardino MA, Staehelin Jensen T, editors. Pain Comorbidities: Understanding and Treating the Complex Patient. Seattle, WA: IASP Press; 2012:279–296. Sribastav SS, Peiheng H, Jun L, et al. Interplay among pain intensity, sleep disturbance and emotion in patients with non-specific low back pain. Peer J. 2017;5(3):e3282. Søndergård S, Vaegter HB, Erlangsen A, Stenager E. Ten-year prevalence of mental disorders in patients presenting with chronic pain in secondary care: a register linkage cohort study. Eur J Pain. 2018;22(2):346–354. Gerdle B, Björk J, Henriksson C, Bengtsson A. Prevalence of current and chronic pain and their influences upon work and healthcare-seeking: a population study. J Rheumatol. 2004;31(7):1399–1406. Doan L, Manders T, Wang J. Neuroplasticity underlying the comorbidity of pain and depression. Neural Plasticity. 2015;2015(2):1–16. Dersh J, Polatin PB, Gatchel RJ. Chronic pain and psychopathology: research findings and theoretical considerations. Psychosom Med. 2002;64(5):773–786. Fitzgibbon M, Finn DP, Roche M. High times for painful blues: the endocannabinoid system in Pain-Depression comorbidity. Int J Neuropsychopharmacol. 2016;19(3):pyv095. Huang WJ, Chen WW, Zhang X. Endocannabinoid system: role in depression, reward and pain control (review). Mol Med Rep. 2016;14(4):2899–2903. Fernandez M, Colodro-Conde L, Hartvigsen J, et al. Chronic low back pain and the risk of depression or anxiety symptoms: insights from a longitudinal twin study. Spine J. 2017;17(7):905–912. Pinheiro MB, Ferreira ML, Refshauge K, et al. Genetics and the environment affect the relationship between depression and low back pain: a co-twin control study of Spanish twins. Pain. 2015;156(3):496–503. Asmundson GJ, Katz J. Understanding the co-occurrence of anxiety disorders and chronic pain: state-of-the-art. Depress Anxiety. 2009;26(10):888–901. Linton SJ, Bergbom S. Understanding the link between depression and pain. Scand J Pain. 2011;2(2):47–54. Linton SJ. A transdiagnostic approach to pain and emotion. J Appl Biobehav Res. 2013;18(2):82–103. Mckillop JM, Nielson WR. Improving the usefulness of the multidimensional pain inventory. Pain Res Manag. 2011;16(4):239–244. de Heer EW, Gerrits MM, Beekman AT, et al. The association of depression and anxiety with pain: a study from NESDA. PLoS One. 2014;9(10):e106907. Means-Christensen AJ, Roy-Byrne PP, Sherbourne CD, Craske MG, Stein MB. Relationships among pain, anxiety, and depression in primary care. Depress Anxiety. 2008;25(7):593–600. Ryan S, Mcguire B. Psychological predictors of pain severity, pain interference, depression, and anxiety in rheumatoid arthritis patients with chronic pain. Br J Health Psychol. 2016;21(2):336–350. Wilson M. Integrating the concept of pain interference into pain management. Pain Manag Nurs. 2014;15(2):499–505. Chiarotto A, Deyo RA, Terwee CB, et al. Core outcome domains for clinical trials in non-specific low back pain. Eur Spine J. 2015;24(6):1127–1142. Amtmann D, Cook KF, Jensen MP, et al. Development of a PROMIS item bank to measure pain interference. Pain. 2010;150(1):173–182. Peolsson M, Börsbo B, Gerdle B. Generalized pain is associated with more negative consequences than local or regional pain: a study of chronic whiplash-associated disorders. J Rehabil Med. 2007;39(3):260–269. Lundberg G, Gerdle B. Tender point scores and their relations to signs of mobility, symptoms, and disability in female home care personnel and the prevalence of fibromyalgia syndrome. J Rheumatol. 2002;29(3):603–613. Ektor-Andersen J, Isacsson SO, Lindgren A, Orbaek P. The experience of pain from the shoulder-neck area related to the total body pain, self-experienced health and mental distress. The Malmö Shoulder-Neck Study Group. Pain. 1999;82(3):289–295. Dragioti E, Larsson B, Bernfort L, Levin LÅ, Gerdle B. 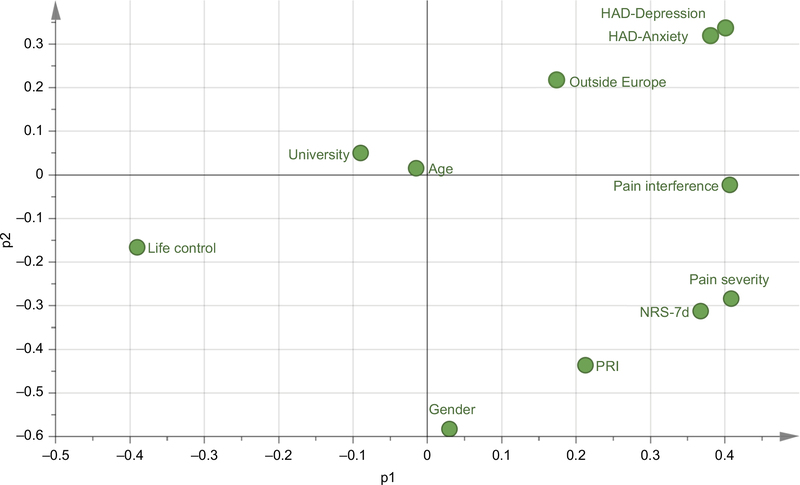 Prevalence of different pain categories based on pain spreading on the bodies of older adults in Sweden: a descriptive-level and multilevel association with demographics, comorbidities, medications, and certain lifestyle factors (PainS65+). J Pain Res. 2016;9:1131–1141. Lindsay PG, Wyckoff M. The depression-pain syndrome and its response to antidepressants. Psychosomatics. 1981;22(7):571–573, 576–577. Goldenberg DL. Pain/depression dyad: a key to a better understanding and treatment of functional somatic syndromes. Am J Med. 2010;123(8):675–682. Scascighini L, Toma V, Dober-Spielmann S, Sprott H. Multidisciplinary treatment for chronic pain: a systematic review of interventions and outcomes. Rheumatology. 2008;47(5):670–678. Weiner SS, Nordin M. Prevention and management of chronic back pain. Best Pract Res Clin Rheumatol. 2010;24(2):267–279. Norlund A, Ropponen A, Alexanderson K. Multidisciplinary interventions: review of studies of return to work after rehabilitation for low back pain. J Rehabil Med. 2009;41(3):115–121. SBU. Methods for Treatment of Chronic Pain: A Systematic Review of the Literature (In Swedish: Metoder för behandling av långvarig smärta : en systematisk litteraturöversikt). Vol 177:1–2. Stockholm: Swedish Council on Health Technology Assessment (SBU); 2006. Busch H, Bodin L, Bergström G, Jensen IB. Patterns of sickness absence a decade after pain-related multidisciplinary rehabilitation. Pain. 2011;152(8):1727–1733. Jensen IB, Busch H, Bodin L, Hagberg J, Nygren Å, Bergström G. Cost effectiveness of two rehabilitation programmes for neck and back pain patients: a seven year follow-up. Pain. 2009;142(3):202–208. Nyberg VE, Novo M, Sjölund BH. Do multidimensional pain inventory scale score changes indicate risk of receiving sick leave benefits 1 year after a pain rehabilitation programme? Disabil Rehabil. 2011;33(17–18):1548–1556. Harlacher U, Persson AL, Rivano-Fischer M, Sjölund BH. Using data from multidimensional pain inventory subscales to assess functioning in pain rehabilitation. Int J Rehabil Res. 2011;34(1):14–21. Craner JR, Skipper RR, Gilliam WP, Morrison EJ, Sperry JA. Patients’ perceptions of a chronic pain rehabilitation program: changing the conversation. Curr Med Res Opin. 2016;32(5):879–883. Silvemark A, Källmén H, Molander C. Improved life satisfaction and pain reduction: follow-up of a 5-week multidisciplinary long-term pain rehabilitation programme. Ups J Med Sci. 2014;119(3):278–286. Whiteneck GG, Gassaway J. SCIRehab uses practice-based evidence methodology to associate patient and treatment characteristics with outcomes. Arch Phys Med Rehabil. 2013;94(4 Suppl):S67–S74. Miles CL, Pincus T, Carnes D, et al. Can we identify how programmes aimed at promoting self-management in musculoskeletal pain work and who benefits? A systematic review of subgroup analysis within RCTs. Eur J Pain. 2011;15775(8):775.e1–e11. Stanos S. Focused review of interdisciplinary pain rehabilitation programs for chronic pain management. Curr Pain Headache Rep. 2012;16(2):147–152. Kaiser U, Treede RD, Sabatowski R. Multimodal pain therapy in chronic noncancer pain-gold standard or need for further clarification? Pain. 2017;158(10):1853–1859. Goesling J, Clauw DJ, Hassett AL. Pain and depression: an integrative review of neurobiological and psychological factors. Curr Psychiatry Rep. 2013;15(12):421. Henry SG, Bell RA, Fenton JJ, Kravitz RL. Goals of chronic pain management: do patients and primary care physicians agree and does it matter? Clin J Pain. 2017;33(11):955–961. Mccracken LM, Zhao-O’Brien J. General psychological acceptance and chronic pain: there is more to accept than the pain itself. Eur J Pain. 2010;14(2):170–175. SBU. Swedish Council on health Technology assessment in health care). Methods of treating chronic pain (in Swedish). SBU Report. 2006;177/1–2. Thompson M, McCracken LM. Acceptance and related processes in adjustment to chronic pain. Curr Pain Headache Rep. 2011;15(2):144–151. Dworkin RH, Turk DC, Wyrwich KW, et al. Interpreting the clinical importance of treatment outcomes in chronic pain clinical trials: IMMPACT recommendations. J Pain. 2008;9(2):105–121. Persson E, Lexell J, Eklund M, Rivano-Fischer M. Positive effects of a musculoskeletal pain rehabilitation program regardless of pain duration or diagnosis. PM R. 2012;4(5):355–366. Farrar JT, Young JP, Lamoreaux L, Werth JL, Poole RM. Clinical importance of changes in chronic pain intensity measured on an 11-point numerical pain rating scale. Pain. 2001;94(2):149–158. Jansen JJ, Szymańska E, Hoefsloot HC, Jacobs DM, Strassburg K, Smilde AK. Between metabolite relationships: an essential aspect of metabolic change. Metabolomics. 2012;8(3):422–432. Pohjanen E, Thysell E, Jonsson P, et al. A multivariate screening strategy for investigating metabolic effects of strenuous physical exercise in human serum. J Proteome Res. 2007;6(6):2113–2120. Eriksson L, Byrne T, Johansson E, Trygg J, Vikström C. Multi- and Megavariate Data Analysis – Basic Principles and Applications. 3rd ed. Malmö: Umetrics Academy; 2013. When the two psychological distress variables were eliminated from the regression models in Table 5, lower explained variations were obtained (MPI-Pain interference: R2=0.35, Q2=0.35, CV-ANOVA P-value <0.001; MPI-Life control: R2=0.19, Q2=0.19, CV-ANOVA P-value <0.001) and only the two pain intensity/severity variables remained as significant regressors. When the pain variables (including PRI) were excluded from the regressions in Table 5 also, the explained variations decreased (MPI-Pain interference: R2=0.29, Q2=0.28, CV-ANOVA P-value <0.001; MPI-Life control: R2=0.34, Q2=0.34, CV-ANOVA P-value <0.001) and only the two psychological distress variables remained as significant regressors. Hence, the pain variables were somewhat more important regressors of MPI-pain interference than the psychological distress variables while vice versa was found for the regressors of MPI-Life control. When only the background variables were used as regressors, significant regressions were obtained but that explained very low part of the variation in MPI-Pain interference (R2=0.02, Q2=0.02, CV-ANOVA P-value <0.001) and in MPI-Life control (R2=0.02, Q2=0.02, CV-ANOVA P-value <0.001). Born outside Europe was significant in both regressions and in the regression of MPI-Life control also University has some importance. For pain interference (R2=0.42, Q2=0.42, CV-ANOVA P<0.001), the following significant regressors were found: pain severity (VIP = 1.88, p(corr) = 0.89), NRS-7d (VIP = 1.40, p(corr) = 0.68) and HAD-Depression (Dichotom) (VIP = 1.34, p(corr) = 0.67). Hence, anxiety was not significant in this regression. For MPI-Life control (R2=0.34, Q2=0.34, CV-ANOVA P<0.001), the following significant regressors were found: HAD-Depression (dichotomy) (VIP = 1.57, p(corr) = –0.78), pain severity (VIP = 1.47, p(corr) = –0.69), HAD-Anxiety (dichotomy) (VIP = 1.44, p(corr) = –0.73) and NRS-7d (VIP = 1.23, p(corr) = –0.61). CV-ANOVA, cross-validated analysis of variance; HAD-Anxiety, Anxiety subscale of Hospital Anxiety and Depression Scale; HAD-Depression, Depression subscale of Hospital Anxiety and Depression Scale; Life control, MPI subscale concerning perceived life control; MPI, Multidimensional Pain Inventory; Pain interference, MPI subscale concerning pain-related interference in everyday life; NRS-7d, average pain intensity the last week according to a numeric rating scale; University, university education; VIP, Variable Importance in Projection.